I don't know that it's relevant to anything, but because I spent a fair amount of time in it when I was young, I happen to recognize the altar photo of Rev. Sherman McCathern at Joy Tabernacle as being of the church building that previously was Community Presbyterian Church. Comm Pres didn't bail for the suburbs...they hung on where they had roots until the congregation no longer was large enough and employed enough to cover the costs of having a minister and keeping the building repaired and heated, then they disbanded. 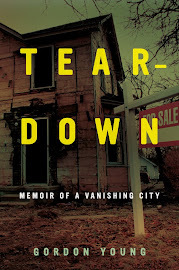 Teardown: Memoir of a Vanishing City devotes a lot of space to Community Presbyterian and Joy Tabernacle. I interviewed several people affiliated with the Comm Pres, including Rev. Timm High and Rick McClellan, who was the final caretaker of the church before it became Joy Tabernacle. Both churches have a fascinating history and a legacy of trying to help Civic Park. And there's no implication that the congregation fled for the suburbs, just that the neighborhood changed and the members dwindled to the point where it was too expensive to keep the church open. And the building was in amazing shape. Not a single stained glass window broken. It's a great story of one group carrying on the legacy of another.